Okay ... remember the Count Down Flip Flop for Sophie and Kevin's Count Down ... well ... these were inspired by a class I took with Heidi Swapp. And I transferred those photos from my PC last night so here I am sharing. When you look at these just think that you are looking at EXTREMELY tired and EXHAUSTED women who are ready to CRASH! 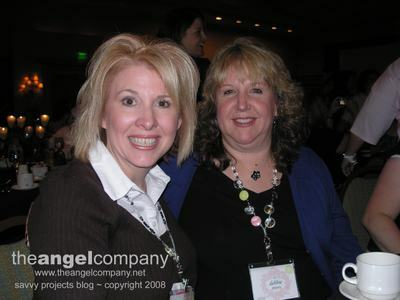 This is a shot of myself and my dear friend Debbie. 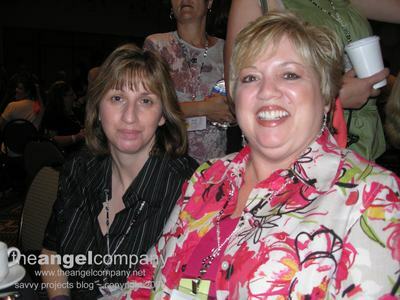 You may know her from Debbie at The Angel Company who writes our Simply Inspired Blog. I LOVE Debbie! She is such a cheerleader for me ... how COOL is that! And ... she's my rock ... she keeps me focused on the BIG picture! What REALLY matters in life! These are our new friends Marlene and Vanessa. 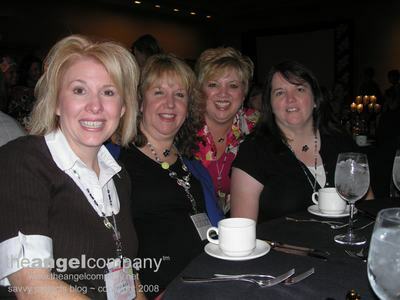 Here we are with Vanessa and another new friend ~ Debbie. The funniest thing about this trip was that I didn't want to go. I felt so GUILTY about it. My creativity was low, I was tired, I had so much to do ... you name it ... I had it. Can I tell you that after this trip I came home REFRESHED, EXCITED, INSPIRED and my creative juices haven't stopped flowing! It was just what the doctor ordered!